Today was one of those days that I didn't accomplish anything on my checklist only for the pure fact I didn't have one today. Instead, I had a slow start taking my time getting ready which is not the norm as we're always rushing in this house. I met one of my very close and longest friends for lunch with her little son who will be 1 year in a week. We had such a great time catching up on all aspects of our lives. It was beautiful, really beautiful. I left our lunch feeling so fulfilled knowing that we are caught up to date with each other's lives and that she's doing great. That feeling is better than clearing out a whole 'to do list' for one month! 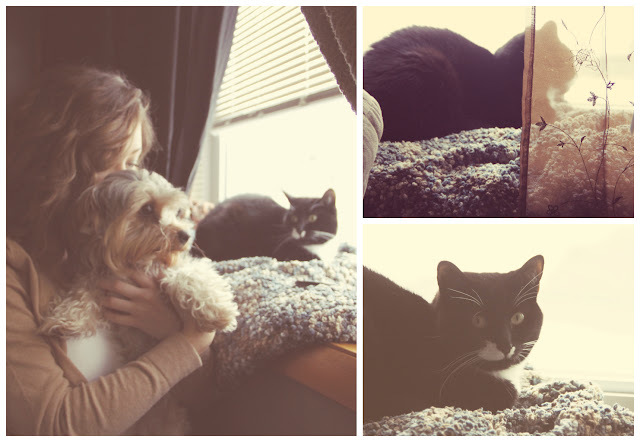 I came home and spent a little time this afternoon laying with some of our babies in the house. It's been so cold and even with our heat we try to not lose any by putting blankets over the windows, heavy blankets. Sure it's not that stylish but we're warm. The sun was out so I pulled the blankets back so our vampire babies could feel the sunlight coming in through the bay window. They loved it, mainly Minnie the tuxedo cat. She's the only girl out of the babies and sure takes ownership hogging the bay window. I sat watching her trying to figure out what she was thinking. I saw a bird fly by and knew she wanted to catch it, play with it and probably eat it? Then there was cars going by and her head went back and forth trying to catch up with them. I really don't think she knows what cars are. Did I mention our cats are indoors? I feel we deprive them, but with all of the wild animals in our back yard I prefer knowing they're all safe. As I write this, I should be getting ready for a comedy show tonight. The Wayans are at the Comedy Club tonight. Shawn & Marlon! I am so excited that I'm trying to relax right now and take some deep breaths. Were you an In Living Color fan? If so, you appreciate seeing any of the Wayans family live! So I'm off and I hope to catch up on Love is Everywhere this weekend. Sending love your way!